We are located in the heart of Cambridge. The Old Courts are on Trinity Street in the centre of Cambridge, at the top of historic King's Parade. A few minutes' scenic walk away over the River Cam is West Road, site of Harvey Court and The Stephen Hawking Building. We have two car parking spaces available for conference and event use at the West Road site - these must be booked in advance. Cambridge is notorious for being less than friendly for cars, so please use the many park and ride sites across the city wherever possible. This map of the University shows the two main sites of the College in the city centre: the Old Courts on Trinity Street and the Harvey Court site on West Road. All College offices are based in the Old Courts. This map can be expanded using the navigation keys to include more of the city. All national bus services currently stop at the main bus station at Drummer Street, about 5 minutes walk from the College. The University map above may be expanded to see the position of the bus station – it is to the east of the main city centre College site. Main routes into Cambridge and the surrounding area are marked on this map. Limited parking is available for visitors at our Harvey Court site. If you are using SatNav then you will need the post code which is CB3 9DS. 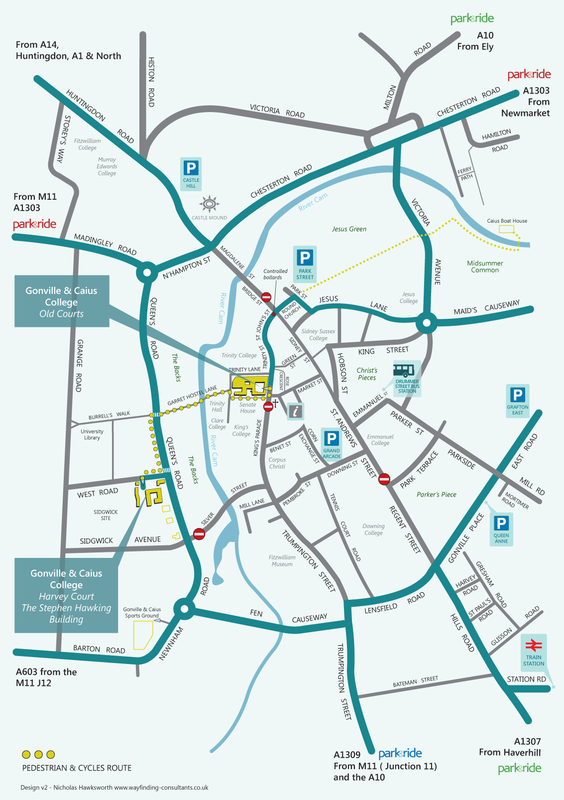 Information about Cambridge City car parks can be found here. Details of Park & Ride sites which can be used to save bringing your car into the city centre are available here. There is an hourly direct train service to Cambridge during the day and the journey time is about half an hour. There is more than one bus service; try the National Express timetables. If you rent a car then take the M11 North but, if you do so, please be aware that there is very limited car parking at College.